MicroRNAs (miRNAs) are a class of small non-coding RNA molecules that have been predicted to control upwards of 60% of all protein coding genes, and their dysregulated expression has been implicated in the pathobiology of more than 150 diseases. A number of strategies have been used to restore depressed tissue miRNA levels in the context of disease. The simplest approach is to administer synthetic miRNA mimics, typically formulated with a cationic lipid or polymer-based vehicle to facilitate cellular uptake and stability. Compared to traditional small molecule therapeutics, miRNA mimics can be highly effective against "non-druggable" targets, such as proteins that lack enzymatic activity or that exhibit structural conformations that are inaccessible to small molecule drug candidates. These challenges can be circumvented by miRNA mimics since they can target virtually any gene of interest at the post-transcriptional level. Moreover, in contrast to more complex strategies requiring stable expression through plasmid or viral delivery systems, dosing of miRNA mimics can be readily adjusted and even withdrawn in the event of adverse reactions. In preclinical animal models of pulmonary disease, lung-targeted delivery of miRNA mimics represents an important consideration for achieving therapeutic effects that are robust, specific and safe. Direct intrapulmonary administration via the trachea or nasal passage, with or without aerosolization, are common methods for delivering miRNA therapeutics. These delivery strategies have been used successfully to modulate miRNA levels in vivo and attenuate disease severity in various animal models of pulmonary hypertension[5-9], which is a disease of particular interest in our laboratory. However, the impact of these various delivery methods on parameters such as miRNA lung yield, persistence, tissue biodistribution, and potential inflammatory response, have not been clearly defined. Thus, a better understanding of how these factors are affected by different delivery strategies has significant potential to improve therapeutic outcomes and reduce off-target effects and toxicity. Furthermore, for a disease such as pulmonary arterial hypertension in which the most salient animal models utilize rats instead of mice, the identification of an optimal delivery strategy can offer significant economic benefits by reducing the quantity of mimic required to achieve therapeutic efficacy. In this study, we sought to determine the optimal method of delivery to achieve high efficiency, selective lung targeting of miRNA mimics in rats. Toward this aim, we systematically investigated the relative merits of intratracheal and intranasal routes of administration, with and without aerosolization of the miRNA mimic. In addition, several control methods including intravenous, intraperitoneal and subcutaneous injection were performed as key comparators to confirm the tissue-selectivity of lung-targeted methods. A synthetic miRNA mimic with no mammalian homologue (cel-miR-39-3p, ThermoFisher) was chosen initially to facilitate the quantification of mimic levels, by circumventing the endogenous basal levels associated with mammalian miRNAs in rats. In subsequent experiments, a mimic of the mammalian miRNA, miR-124-3p (cat# 4464070, ThermoFisher) or mirVanaTM negative control mimic (cat# 4464061, ThermoFisher), was also delivered in rats. To improve stability and cellular uptake of mimics, the liposome-based transfection reagent, invivofectamine 3.0 (cat# IVF3001, ThermoFisher), was used as a vehicle to deliver mimics in vivo. For cel-miR-39 experiments, all rats received a fixed quantity of mimic (0.5 nmol) suspended in a total vehicle volume of 50 µL (5% invivofectamine in PBS). The quantity of mimic and vehicle volume were standardized to facilitate comparisons between each delivery method. The mimic-invivofectamine complex for a single dose was prepared by combining 1.25 µL of 0.4 nmol/µL mimic with 1.25 µL of invivofectamine-complexation buffer (ThermoFisher), followed by addition of 2.5 µL of invivofectamine (pre-equilibrated to room temperature). The resulting mixture was vortexed vigorously for 2 s, then incubated at 50°C for 30 min. The final injection solution was prepared by diluting the above mimic-invivofectamine complex with 45 µL of 1x PBS pH 7.4. The mimic solution was maintained at room temperature during the procedure. Of note, mimic doses were prepared as an appropriate sized master mix based on the above recipe. For miR-124-3p experiments, the vehicle was prepared as an 8% invivofectamine in PBS solution. All animal procedures were approved by the University of Ottawa's Animal Care Ethics Committee and complied with the principles and guidelines of the Canadian Council on Animal Care. No gross abnormalities in the appearance of animals or tissues were observed by visual inspection, nor was there any mortality associated with the use of any of the tested delivery methods. Lung-targeted delivery strategies included intratracheal liquid instillation (IT-L), intratracheal aerosolization (IT-A), intratracheal ventilator-assisted aerosolization (IT-AV), intranasal liquid instillation (IN-L), and intranasal aerosolization (IN-A). Intravenous (IV; via jugular vein), intraperitoneal (IP) and subcutaneous (SC) delivery served as control methods. Male Sprague-Dawley rats (~250 g; Charles River) were anesthetized with 5% isoflurane (for IN-A, IN-L and IV delivery), or 100 mg/kg ketamine and 20 mg/kg xylazine (for IT-L, IT-AV, and IT-A delivery). Rats were supported by a silk suture under their upper incisors, in a 45° angle supine position on an intubation platform. The tracheal lumen and vocal cords were clearly visualized by percutaneous transillumination using a fiber optic surgical light positioned at the surface of the skin near the pharyngoepiglottic region of the neck. A 16 gauge angiocatheter (1.44 in., 1.7 x 45 mm; BD Inyte Autoguard cat#381457) was modified for oral intubation. The catheter needle was made to be ~3 mm shorter than the polyethylene tube of the catheter, and the distal tip was blunted to remove sharp edges to prevent injury to the rats during intubation. The tongue was gently pulled out of the mouth and held off to the side to permit entry of the catheter with modified needle stylet. The needle stylet was immediately removed, and proper catheter placement within the trachea (rather than esophagus) was confirmed by placing a small mirror at the proximal end of the catheter, and observing water vapour condensation from the exhaled air. The liquid-mimic-invivofectamine solution was injected into the catheter with a p200 micropipette, using a quick and continuous motion. To minimize residual liquid left in the catheter or in the upper airways, an inflation bulb was subsequently attached to the proximal end of the catheter and pumped 3 times. Rats were held at the 45° supine position for at least 15 s after mimic delivery, prior to returning them to their cages. Rats were intubated as described above. Aerosolized mimic was generated using the Aeroneb lab micropump nebulizer (AG-AL1100, small VMD 2.5-4 µm; Kent Scientific), which was connected to an O2 tank to facilitate transport of the aerosolized mimic by compressed air flow into the lungs. The O2 regulator was set to the lowest available flow rate (0.1 L/min). Through the coordinated actions of two operators, the mimic solution was added to the input port of the nebulizer, and the nebulizer was in turn connected to the catheter of the intubated rat. The connection was maintained for 20 s (until no further aerosol was generated), and then promptly removed. Rats were intubated as described above. Aerosolized mimic was generated using the Aeroneb lab micropump nebulizer, which was connected to the catheter of the intubated rat, and to the SAR-1000 small animal ventilator (CWE Inc.). Aerosolized mimic was transported to rat lungs during ventilation for 50 s (1 mL tidal volume, 0.1 L/min, 50 breaths/min, 50% insp), until no more aerosol was visible. After anesthesia induction, rats were held in an upright supine position and the mimic solution was slowly added drop-wise with a p200 micropipette directly to the nares (alternating between the left and right sides). Anesthetized rats were placed in a closed plexiglass chamber with sliding top (cat# SOMNO-0530LG; Kent Scientific; W 22.9 cm x H 15.2 cm x D 15.2 cm) facing the inlet port fitted with a nose cone. The chamber was connected serially to the Aeroneb lab micropump nebulizer and O2 tank (0.1 L/min flow rate). The mimic solution was added to the nebulizer and rats were allowed to inhale the aerosol within the chamber over a period of 5 min. Intravenous delivery was performed via the jugular vein given its proximity to the lungs, and because we have previously found this route to be more reliable than tail vein injections. The area around the incision site was shaved and cleaned and the jugular vein then exposed and ligated. A 20 gauge catheter was inserted into the jugular vein and the connection tightened with a silk suture knot. The mimic solution contained in 0.5 mL syringe was connected to the catheter and slowly injected. The ligation sutures were tightened after removing the catheter, and the wound was cleaned and stapled shut. The wound was covered with 1 mL of topical anesthetic (1.25 mg/kg Bupivicaine) and the rats were returned to their cages. Of note, cel-miR-39 mimic levels in the lung, heart, kidney, liver and spleen of the 6 control rats that received mimic via intravenous delivery (representing part of Fig. 3A and 3B) have been reported elsewhere . Rats were injected behind the shoulders with mimic solution using a 26 gauge needle attached to a 0.5 mL syringe. Rats were injected in the lower left quadrant of the abdominal area with mimic solution using a 26 gauge needle attached to a 0.5 mL syringe. Rats were euthanized at various time points after mimic delivery (n=3 rats/time point/method), and miRNA quantification was performed as previously described. Briefly, total RNA was extracted from ~25 mg of tissue or 200 µL of plasma using the miRNeasy mini kit (Qiagen), and eluted in 50 µL of RNase-free H2O. A fixed quantity of exogenous spike-in control, cel-miR-54 (10 fmol), was added to each plasma sample just after chemical denaturation of endogenous ribonucleases to control for variations in RNA extraction, RT and PCR efficiency between specimens. For tissue extraction, an additional on-column DNase digestion was performed. A fixed mass of 2 µg of total RNA (extracted from tissue) or fixed volume of 5 µL of RNA eluate (extracted from plasma) was used for reverse transcription in the miScript II RT kit (Qiagen). A fixed mass of 1 ug of total RNA (extracted from tissue) was used for reverse transcription in the Quantitect RT kit to generate cDNA for messenger RNA targets. The quality of RNA extracted from tissue was reflected by absorbance ratios of ~2, and Agilent Bioanalyzer RIN numbers above 7.0. MiRNA levels were subsequently quantified using miScript PCR reagents, primers and PCR cycling conditions according to manufacturer instructions (Qiagen) using a CFX384 PCR machine (Biorad). Messenger RNA levels were quantified using Quantitect PCR reagents, primers, and PCR cycling conditions according to manufacturer instructions (Qiagen). Normalized relative miRNA expression levels were calculated using the formula 2-ΔCq, where ΔCq = Cq(target miRNA) - Cq(reference control). A quantification cycle (Cq) threshold of 35 was predefined as the PCR detection limit based on manufacturer recommendations. Tissue miRNA levels were normalized to RNU6-2, while plasma miRNA levels were normalized to cel-miR-54. Tissue mRNA levels were normalized to B2M. Lung tissue lysate was prepared by disrupting 70-100 mg of frozen tissue in liquid nitrogen by mortar and pestle, and subsequent homogenization in 1 mL of chilled Milliplex MAP lysis buffer (Millipore: cat#43-040) supplemented with Protease Inhibitor Cocktail Set III (Millipore: cat#535140) using a 5 mm steel bead/sample in the TissueLyser II system (Qiagen). IL-6, TNFα, and MCP-1 protein levels were measured in 2x diluted lung tissue lysate by Luminex xMAP technology using the Milliplex brand of rat magnetic-bead fluorescent immunoassays (Millipore: cat#RECYTMAG-65K), according to manufacturer instructions. Tissue lysate samples had been subject to only 1 freeze-thaw cycle at time of measurement. All assays were run on a Bioplex 200 system (Biorad). Data were fit to a 7-point standard curve generated using 5-parameter logistic regression with Bioplex manager software. Extrapolated values were used for samples that exhibited fluorescent signals above background (i.e., above blank samples) but below the standard curve range. Lysate cytokine concentrations (in pg/mL) were normalized to total protein concentration (in mg/mL, as determined by bicinchoninic acid assay), then expressed as fold change to baseline levels detected in two treatment-naive healthy rats (IL-6 = 81 ± 4; TNFα = 0.4 ± 0.1; MCP-1 = 75 ± 8; mean ± SD, pg cytokine/mg total protein). Statistical tests were performed with Graphpad Prism V7.0. For three or more group comparisons, one or two-way analysis of variance (ANOVA) with a multiple comparisons post test was performed as appropriate. Specific statistical tests are reported in each figure legend. Five different lung-targeted strategies were assessed including intratracheal liquid instillation (IT-L), intratracheal aerosolization (IT-A), intratracheal ventilator-assisted aerosolization (IT-AV), intranasal liquid instillation (IN-L), and intranasal aerosolization (IN-A). In addition, intravenous (IV; via jugular vein), intraperitoneal (IP) and subcutaneous (SC) delivery served as control methods for further comparison. To facilitate the quantification of mimic levels without interference from background levels of endogenous miRNA, a synthetic miRNA mimic with no mammalian homologue (cel-miR-39) was utilized in each method. At 2 h post delivery, the highest levels of cel-miR-39 were achieved in the lungs after delivery by IT-L (mean ± SD; 9.4 ± 4.5, 2-ΔCq expression units, Fig. 1A), which was significantly higher (p=0.001) than all other methods. Cel-miR-39 lung levels differed by up to 4 orders of magnitude between the least (SC) and most effective (IT-L) delivery method (Fig. 1A). The relative effectiveness among lung-targeted strategies also differed by orders of magnitude depending on whether the mimic was in solution or aerosolized. Mean expression levels progressively fell with delivery by IN-L (~10-fold down vs. IT-L), IT-AV (~30-fold down), IV (~100-fold down), IN-A (~200-fold down), IP (~300-fold down), IT-A (~12,000 fold down) and SC (~14,000-fold down) (Fig. 1A). At 24 h post delivery, the highest lung levels of cel-miR-39 were again achieved by IT-L (mean ± SD; 0.1 ± 0.09, 2-ΔCq expression units), which was significantly higher than other methods (all p<0.05) that progressively decreased with delivery by IN-L (~5-fold down), IV (~10-fold down), IT-AV (~20-fold down), IN-A (~300-fold down), IP (~700-fold down), IT-A (~1100-fold down), and SC (~1600-fold down) (Fig. 1B). 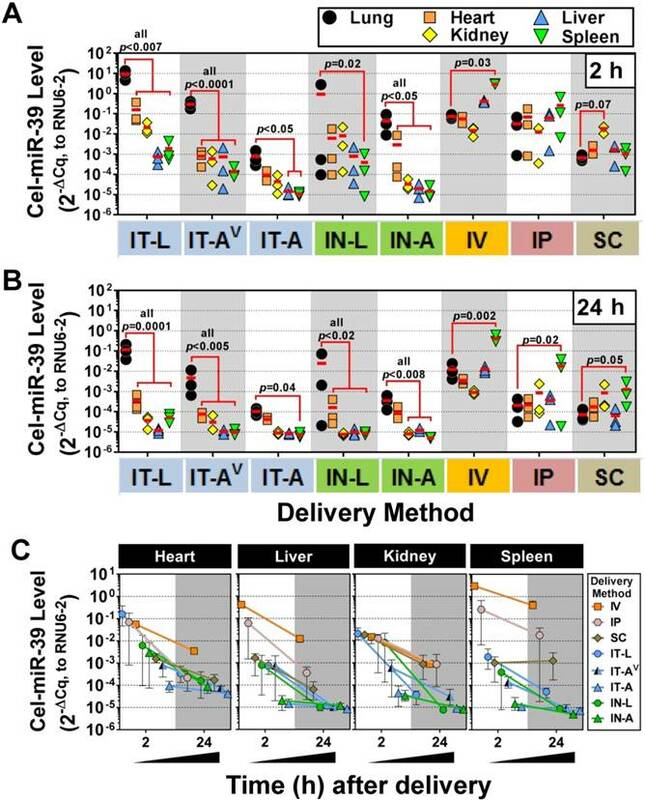 Thus, the relative rank order of lung mimic levels obtained between the different delivery methods was largely comparable at 2 h and 24 h. Cel-miR-39 remained detectable in the lung 24 h post delivery across all methods, but levels were ~10- to 100-fold lower (Fig. 1C). Although aerosolization of the miRNA mimic proved to be less effective than liquid instillation in achieving high lung levels, we hypothesized that it might offer other benefits such as a more uniform distribution within the lung. In addition, aerosolization represents a more clinically relevant method for drug delivery in patients. To gain insight into how well each delivery method distributed cel-miR-39 within the lungs, a fixed mass of RNA was compared between the whole right caudal lobe and distal tip of the left lobe (Fig. 2A). 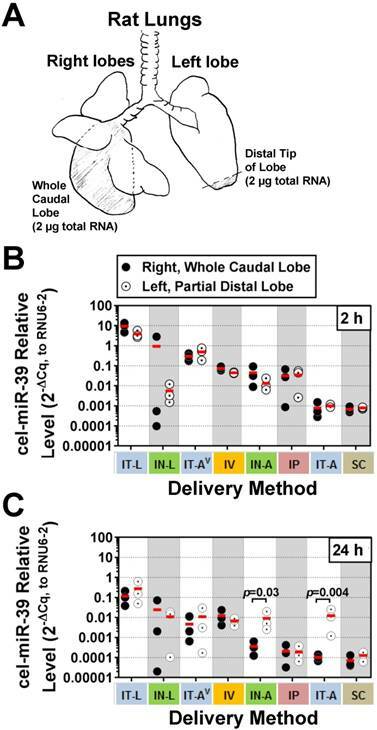 At 2 h post delivery, no significant differences were detected in cel-miR-39 levels between samples taken from the whole right caudal lobe and distal tip of the left lobe, irrespective of the delivery method (Fig. 2B). The distribution of cel-miR-39 in the lungs at 24 h was also generally comparable between the right and left lobes, with the exception of delivery by IN-A and IT-A, which showed higher mimic levels in the distal left lobe (25- and 121-fold, respectively; p=0.03 and p=0.004, respectively). We next sought to investigate the lung-selectivity associated with each delivery method. At 2 h post-delivery, levels of cel-miR-39 in the heart, kidney, liver and spleen were all significantly lower (from ~10- to 10,000-fold) than lung levels achieved after delivery by IT-L (all p<0.007), IT-AV (all p<0.0001) and IN-A (all p<0.05) (Fig. 3A). IT-A and IN-L methods also showed evidence of lung-selective delivery, as reflected by markedly lower mimic levels (i.e., >10-fold) in the other tissues, though only some of these reached statistical significance (e.g., p<0.05 for liver and spleen in IT-A; p=0.02 for spleen in IN-L). In general, intrapulmonary delivery routes all showed the same relative tissue biodistribution pattern, with the highest mimic levels found in the lung, followed by the heart, then kidney and liver ≈ spleen (Fig. 3A). Non-pulmonary delivery routes showed very different tissue biodistribution patterns (Fig. 3A). With IV delivery, cel-miR-39 was significantly higher in the spleen compared to the lung (40-fold, p=0.03), while levels in other tissues were not significantly different from the lung. IP delivery showed comparable mimic uptake across all tissues. SC delivery also showed comparable mimic uptake across all tissues, though a trend (p=0.07) toward higher levels were observed in the kidney compared to the lung. At 24 h post delivery, the overall pattern of lung selectivity and tissue biodistribution were largely preserved (Fig.3B), but mimic levels were generally ~10- to 100-fold lower (Fig. 3C). Pulmonary levels of cel-miR-39 mimic in rats after delivery by different strategies. Relative levels of cel-miR-39 determined by RT-qPCR are shown at 2 h (A) and 24 h (B) post delivery (normalized to RNU6-2). Delivery methods are arranged from left to right in descending order of lung mimic levels. Individual biological replicates are shown (n=3 rats/method/time point), and mean levels are denoted by red horizontal lines. P values were derived from one-way ANOVA and Dunnett's multiple comparison test versus IT-L group. (C) Change in cel-miR-39 lung levels from 2 h to 24 h, shown as mean ± range (n=3 rats/method/timepoint). Intrapulmonary distribution of cel-miR-39 mimic in rats after delivery by different methods. (A) Schematic of the specific regions of the lungs (shaded) that were assessed, including the whole right caudal lobe and distal tip of the left lobe. 2 µg of total RNA was used for RT-qPCR analysis of cel-miR-39 levels. Relative levels of cel-miR-39 assessed at 2 h (B) and 24 h (C) post delivery (normalized to RNU6-2). Individual biological replicates are shown (n=3 rats/tissue/delivery method/time point), with mean levels denoted by horizontal red lines. Delivery methods have been arranged from left to right in descending order of lung mimic levels. P values were determined by Two-way ANOVA and Fisher's LSD test performed on log 10 transformed data. We next sought to investigate whether there were differences in the level of mimic variability observed in the lungs and other tissues between the different delivery strategies. On average, pulmonary levels of cel-miR-39 showed the lowest variability between biological replicates when delivered via IV or SC method, exhibiting a mean coefficient of variation of 52% for the 2 h and 24 h time points (Fig. 4A). Lung mimic levels also showed relatively low variability when delivered via IT-L (60% mean CV of 2 h and 24 h). Aerosolized mimic delivered via the intratracheal or intranasal route showed moderate variability ranging from 60-84% CV, while IP and IN-L methods showed markedly higher levels of variability in the lung (ranging from 100% and 170 % CV, respectively, Fig. 4A). When the variability in mimic level was assessed in multiple tissues including the lungs, heart, liver, kidney and spleen, a similar order of increasing variability was observed between the different delivery methods (Fig. 4B). Of note, the overall variability in mimic levels for the five tissues assessed in the IT-L delivery group was significantly higher than the level in the IV group (p=0.02), but significantly lower than the level of the IN-L group (p=0.004). Other methods showed no significant differences in the level of mimic tissue variability compared to IT-L (Fig. 4B). Plasma levels of cel-miR-39 were assessed to determine how well intrapulmonary delivery routes can provide access to the systemic circulation. This information may be useful for applications targeting vascular endothelial cells. All methods showed elevated plasma levels of cel-miR-39 at 2 h post delivery, which varied widely from ~10- (IN-A) to ~1,000,000-fold (IV) above background levels. Mimic delivery by IT-L, which showed the highest lung levels, also exhibited among the highest plasma levels (mean ± SD, 0.19 ± 0.09, 2-ΔCq relative expression units) (Fig. 5A), which was not significantly different from the levels obtained after delivery by IP (0.5 ± 0.5), IN-L (0.2 ± 0.3) or SC (0.07 ± 0.007). Plasma levels of cel-miR-39 after IT-L delivery were ~ 40- to 2700-fold higher than levels obtained after IT-AV (0.005 ± 0.006), IT-A (0.0001 ± 0.00003) and IN-A (0.00007 ± 0.00001) (all p < 0.01), but ~ 50-fold lower than levels reached after IV delivery (p=0.02). Plasma levels of cel-miR-39 returned to baseline levels 24 h after delivery by the intrapulmonary methods (Fig. 5B); however, plasma levels in the IV, IP and SC groups all remained significantly elevated (by at least 100-fold; all p<0.0005) compared to the IT-L group. 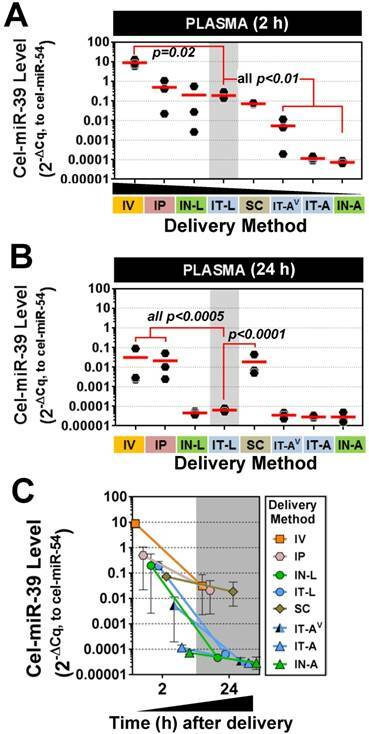 The majority of methods showed a marked decline in cel-miR-39 plasma levels from 2 h to 24 h post delivery, ranging from ~ 20-fold (IP) to ~ 4000-fold (IN-L) down. The IT-A, IN-A and SC delivery methods showed a more modest decline in mimic level ranging from 2.4- to 3.9-fold down. Of note, mimic levels for IT-A and IN-A methods reached baseline levels at 24 h, which would limit the magnitude of their decline. Tissue biodistribution of cel-miR-39 mimic in rats after delivery by different methods. Relative levels of cel-miR-39 in the lung, heart, kidney, liver and spleen were assessed at 2 h (A) and 24 h (B) post delivery by RT-qPCR (normalized to RNU6-2). Individual biological replicates are shown (n=3 rats/tissue/delivery method) with mean levels denoted by red horizontal lines. P values were determined by Two-way ANOVA and Dunnett's multiple comparison test on log transformed data. (C) Change in cel-miR-39 tissue levels from 2 h to 24 h, shown as mean ± range (n=3 rats/method/time point). We next sought to validate the intratracheal liquid delivery method using a mimic of an endogenous mammalian miRNA (rno-miR-124), in contrast to the non-mammalian cel-miR-39 mimic used in preceding experiments. Because miR-124 exhibits basal expression in the lung and other tissues, two different doses of mimic (1 and 10 nmol/rat) were compared to levels in control rats that received only the liposome vehicle. The pulmonary levels of miR-124 were significantly elevated in rats that received 1 nmol or 10 nmol of mimic (~100-fold) as compared to vehicle control rats at 2 h, 24 h and 48 h post delivery (all p<0.0001) (Fig. 6A). Transcript levels of two known targets of miR-124, Ptbp1 and Pkm2, showed a consistent trend toward decreased levels at 24 h and 48 h compared to the vehicle control group, though only some of the changes reached statistical significance (p<0.05) (Fig. 6A). Interestingly, at the early 2 h time point, Ptbp1 and Pkm2 levels appeared to be transiently upregulated by the 10 nmol mimic dose relative to the vehicle control group. The levels of miR-124 were also enriched specifically in the lung following IT delivery of the mimic. There was a significant, but transient, increase in the levels of miR-124 in the heart at 2 h post delivery (~40- to 170-fold for 1 nmol and 10 nmol doses, both p<0.0001 vs. veh ctrl), which subsequently disappeared at the later 24 h and 48 h endpoints for both the 1 and 10 nmol/rat doses (Fig. 6B). The kidney also showed a significant, but only transient increase (6-fold for 10 nmol/rat dose, p=0.0003) in miR-124 levels at 2 h post delivery. Levels of miR-124 in the liver and spleen showed no significant elevations above vehicle control levels at any of the assessed time points using either the 1 or 10 nmol/rat mimic dose (Fig. 6B). Interestingly, delivery of 10 nmol of mimic/rat, resulted in miR-124 lung levels that were only ~2- to 3-fold higher than the 1 nmol/rat mimic dose at both 24 h and 48 h (p=0.04) post delivery (Fig. 6A). We speculated that the non-linear increase in miR-124 lung levels observed between the 1 nmol and 10 nmol doses might be due to a suboptimal ratio of mimic to liposomes in the vehicle (i.e., some fraction of the mimic may not be complexed with the liposome, with free mimic molecules being more susceptible to nuclease degradation and poor cellular uptake). We therefore evaluated increasing levels of the invivofectamine reagent, using an intermediate dose of 3 nmol/rat (Fig. 6C). Of note, the total vehicle delivery volume was also increased proportionally (to maintain the percentage of invivofectamine in PBS), which is necessary to dilute salts within the invivofectamine reagent that may be toxic at higher concentrations. In addition, we replaced the empty-vehicle control with a negative control mimic to exclude any potential non-specific nucleic acid-related effects on miR-124 levels. When assessed at 2 days post delivery, doubling the vehicle volume resulted in a 2-fold increase in miR-124 levels relative to rats that received the negative control mimic (i.e., 200-fold vs. 100-fold higher than neg ctrl mimic), though a further increase in miR-124 levels was not observed upon quadrupling the vehicle (Fig. 6C). Interestingly, when assessed at 4 days post delivery, an approximate linear relationship was observed between the vehicle volume and miR-124 lung levels (Fig. 6C), suggesting that increasing the amount of liposome/vehicle for a given quantity of mimic can be beneficial. Increasing the vehicle volume also appeared to reduce the variability in lung mimic levels between biological replicates, suggesting another potential benefit (Fig. 6D). Persistence of miR-124 was assessed for up to 7 days following a single intratracheal dose of miR-124 mimic (3 nmol in 200 µL vehicle delivery volume), which showed that pulmonary levels of miR-124 remained ~50-fold higher than levels in the negative control group (Fig. 6E). We next sought to determine the effects of repeated mimic dosing on miRNA levels (i.e., 3 doses/week for 2 weeks, at 3 nmol mimic/rat with 100 µL vehicle, and 48 h endpoint). Pulmonary levels of miR-124 (assessed 48 h after the last dose), were only ~2-fold higher with 6 doses compared to a single dose (Fig. 6F). Since repeated doses of mimic could potentially saturate clearance mechanisms and accumulate in non-target organs, we assessed the tissue specificity as well. After 6 doses of mimic, the relative tissue specificity remained largely unchanged, with mimic levels in the lungs ~100-fold higher than in the heart, and ~1000-fold higher than levels observed in the liver, kidney and spleen (Fig. 6G). Comparison of variability in mimic tissue levels between different delivery methods. (A) Coefficient of variation in cel-miR-39 mimic levels between biological replicates assessed in the lung at 2 h and 24 h post delivery. (B) Coefficient of variation in cel-miR-39 mimic levels between biological replicates assessed in five different tissues at 2 h post delivery. Each data point denotes the variation from n=3 rats/time point/method (part A), or n=3 rats/tissue/method (part B). Red horizontal lines denote mean level. Delivery methods are arranged from left to right in ascending order of variability. P values denote results of one-way ANOVA and Dunnett's multiple comparison test versus the IT-L group. Plasma levels of cel-miR-39 mimic after in vivo delivery by different methods. Cel-miR-39 mimic levels were assessed at 2 h (A) and 24 h (B) post delivery by RT-qPCR. Cel-miR-54 was used as an internal spike-in control. Delivery methods are arranged in panel A from left to right in descending order of plasma mimic levels. Data are presented as individual biological replicates (n=3 rats/method) and mean level (red horizontal bar). P values denote results of one-way ANOVA and Dunnett's multiple comparison test versus the IT-L group on log transformed data. (C) Change in cel-miR-39 plasma levels from 2 h to 24 h, shown as mean ± range (n=3 rats/method/time point). To determine whether intratracheal liquid delivery of the mimic (and/or lipid vehicle) might induce undesired inflammatory effects, pulmonary transcript and protein levels of three proinflammatory cytokines (IL-6, TNFα and MCP-1) were assessed at various time points, mimic doses, and vehicle volumes. Relative to baseline levels assessed in healthy rats, the delivery of invivofectamine vehicle alone or with miR-124 mimic (1 or 10 nmol/rat) showed only modest increases in cytokine levels that were generally less than 3-fold above baseline at both the transcript and protein level, and appeared to be independent of mimic dose (Fig. 7A,B). Two of 27 rats showed sporadic elevations in IL-6 transcript levels between 5- and 20-fold above baseline (Fig. 7A), though IL-6 protein levels in these rats were less than 3-fold above baseline (Fig. 7B). Increasing the volume of invivofectamine (by 2- to 4-fold) showed a potential trend toward higher cytokine expression in the lungs (ranging from ~2- to 8-fold above basal levels) at 2 days post delivery (Fig. 7C,D); however, this effect was sporadic and appeared to be a transient response that was not detectable after 4 and 7 days post delivery (Fig. 7E,F). For comparison, IL-6, TNFα and MCP-1 transcript and protein levels were also assessed in several animal models of disease associated with varying levels of pulmonary inflammation. In the Sugen plus chronic hypoxia (SuHx) rat model of pulmonary hypertension (PH), pulmonary transcript levels of IL-6 ranged from ~2- to 9-fold (mean 4-fold) above basal levels six weeks after model initiation (Fig. 7G), though protein levels showed no apparent elevation from baseline (Fig. 7H). TNFα and MCP-1 transcript and protein levels also remained at baseline levels in the SuHx rat model (Fig. 7G,H). IL-6 mRNA levels in the lungs of rats with monocrotaline (MCT)-induced PH ranged from ~9- to 72-fold (mean 29-fold) above basal levels three weeks after model initiation (Fig. 7G), but protein levels showed only modest elevations (i.e., 2- to 5-fold above baseline) in only 2 of 4 rats that were assessed (Fig. 7H). MCP-1 transcript levels were elevated 6- to 7-fold above baseline, and protein levels were elevated 2- to 3-fold in MCT rats, whereas no increase in TNFα expression was detected (Fig. 7G,H). Of note, the low pulmonary expression levels of IL-6, TNFα and MCP-1 observed in the SuHx- and MCT-induced PH rat models in this study are consistent with the low plasma levels that have been reported previously . Finally, rats with acute lung injury induced by intratracheal delivery of lipopolysaccharide (LPS) showed marked elevations in all three cytokines at both the transcript (mean ± SD fold change to baseline: IL-6, 499 ± 345; TNFα, 18 ± 18; MCP-1, 36 ± 20) and protein levels (mean ± SD fold change to baseline: IL-6, 121 ± 114; TNFα, 402 ± 343; MCP-1, 30 ± 15). Taken together, these data suggest a relatively minimal inflammatory response to the intratracheal administration of mimic and/or liposome-based delivery vehicle. Characterization of IT-L mimic delivery with an endogenous mammalian miRNA. (A) Pulmonary levels of miR-124 and transcript levels of two known targets (Ptbp1 and Pkm2) after IT-L mimic delivery. Rats received either vehicle alone (8% invivofectamine in PBS; 50 µL total volume. ), or vehicle complexed with 1 nmol or 10 nmol of miR-124 mimic. P values were determined by Two-way ANOVA and Tukey's multiple comparisons test on log transformed data (n=3 rats/treatment/time point). (B) Non-pulmonary tissue biodistribution of miR-124 after IT-L mimic delivery. Rats received either vehicle alone (8% invivofectamine in PBS; 50 µL total volume. ), or vehicle complexed with 1 nmol or 10 nmol of miR-124 mimic. (C) Effects of increasing vehicle volume on miR-124 lung levels. A fixed quantity of miR-124 mimic or negative control mimic (3 nmol/rat) was administered with increasing vehicle volumes (8% invivofectamine in PBS proportionally scaled up), and rats were evaluated 2 and 4 days after delivery. Left panels show relative normalized levels of miR-124, while the right panel shows miR-124 expressed as the fold change to the negative control mimic group (n=2 rats/vehicle volume/time point). Bar chart shows mean and range. (D) Coefficient of variation in lung mimic levels assessed in part C (standard deviation/mean of 2 biological replicates) as a function of vehicle volume. Data are shown for 2 and 4 days post delivery. (E) Persistence of miR-124 lung levels up to 7 days post delivery. Left panels show the relative normalized level of miR-124, while the right panel shows corresponding miR-124 data expressed as the fold change to the negative control group (n=2 rats/treatment/time point). (F) Comparison of miR-124 lung levels after 1 versus 6 doses of mimic. Three nmol of miR-124 mimic (in 100 µL total vehicle volume) was given once or six times (3 doses/week for 2 weeks), and evaluated 48 h after the last dose. (G) Tissue biodistribution of miR-124 assessed 48 h after the last of the 6 mimic doses (n=3 rats). Individual biological replicates are shown with mean level denoted by red horizontal lines. No statistical tests were performed on groups with sample sizes of n<3. 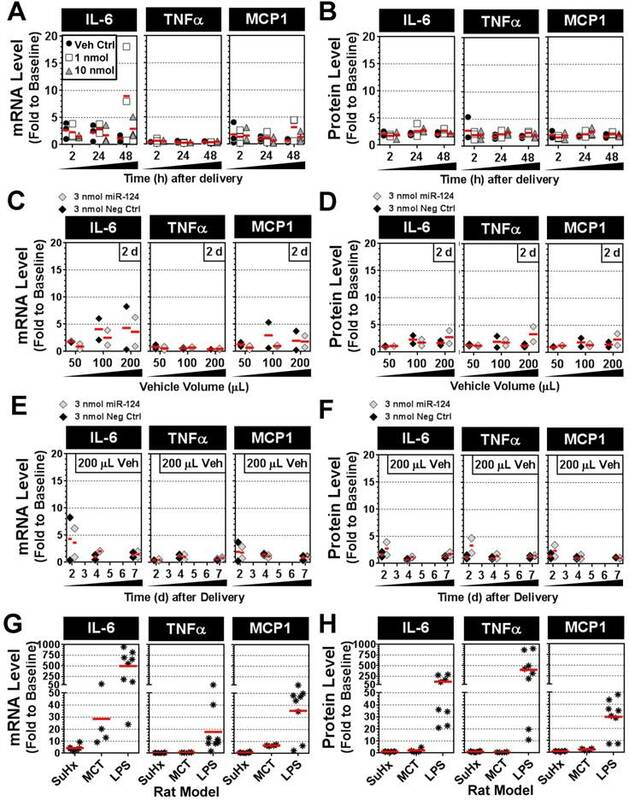 Pulmonary expression levels of proinflammatory cytokines IL-6, TNFα and MCP-1 after mimic delivery. Messenger RNA (A) and protein (B) levels of cytokines are presented as fold change to baseline levels detected in two healthy rats at the specified times following delivery of the miR-124 mimic (at 1 or 10 nmol/rat) or vehicle alone control. Individual biological replicates are shown (n=3 rats/treatment/time point). Fold change in cytokine mRNA (C) and protein (D) levels 2 days post delivery when administered with an increasing volume of the invivofectamine/PBS vehicle. A fixed quantity of either miR-124 mimic or negative control mimic (3 nmol/rat) was used. Individual biological replicates are shown (n=2 rats/treatment/vehicle volume). Fold change in cytokine mRNA (E) and protein (F) levels at 2, 4 and 7 days post delivery using 3 nmol/rat of miR-124 or negative control mimic with a 200 µL vehicle volume (n=2 rats/treatment/time point). Fold change in cytokine mRNA (G) and protein (H) levels for three different rat models. In the SuHx model of pulmonary hypertension, rats (n=6) received a single subcutaneous injection of SUGEN (20 mg/kg) and were exposed to hypoxic conditions for 3 weeks, followed by another 3 weeks of exposure to normoxia. Rats were assessed at the end of week 6. In the MCT model, rats (n=4) received a single intraperitoneal injection of monocrotaline (60 mg/kg), and were assessed after 3 weeks. In the LPS model of acute lung injury, rats (n=8) received a single intratracheal injection of lipopolysaccharide (4 mg/kg) and were assessed after 2 h, 4 h, 6 h and 24 h (n=2 rats/time point). In this study, we investigated the relative performance of different methods of delivering synthetic miRNA mimics to the lungs of rats. Our results showed that intratracheal instillation of a liquid formulation of the mimic offered the best combination of high lung levels, lung-specificity, and low variability between biological replicates, among 8 different methods that were evaluated. Pulmonary levels of the miRNA mimic were shown to vary by up to 4 orders of magnitude between different delivery methods, demonstrating the impact of both the route of administration and mimic formulation. To the best of our knowledge, this is the first study to systematically investigate the relative merits of different strategies for delivering miRNA mimics in vivo. Although all methods showed elevated lung levels of the cel-miR-39 mimic after delivery, intratracheal and intranasal routes of administration were clearly superior for lung-selective targeting. This selectivity was evidenced by pulmonary levels that were at least 10-fold, and up to 10,000-fold, higher than levels observed in other tissues. In applications where lung-targeted mimic delivery is not an essential requirement, intraperitoneal and subcutaneous administration could serve as alternative methods to increase lung miRNA levels without the need for anesthesia. However, the lower efficiency of lung delivery would limit these strategies to miRNAs that do not have high endogenous basal levels. Another important finding of this study was the apparent advantage of delivering the miRNA mimic as a liquid rather than aerosol. Previous studies have indicated that some aerosolized materials may be distributed more uniformly within the lungs[13, 14]; however, we observed no clear evidence to support this potential advantage for delivery of miRNA mimics. Pulmonary levels of the mimic after IT delivery as a liquid formulation were shown to be comparable between the whole right caudal lobe and distal tip of the left lobe. Although we cannot exclude the possibility that aerosolization might improve mimic delivery to other distal regions in the three right lobes that were not assessed in the current study, our data suggest that any differences in the pulmonary distribution of mimic between liquid and aerosol formulations might be relatively modest. Our findings are consistent with another study that showed similar pulmonary distributions of india ink when delivered by intratracheal instillation of a liquid suspension versus aerosol. It is worth noting that the similar performance between liquid and aerosol delivery in this previous study was shown to be dependent on delivering the liquid with high speed to rats that were held at a 45° to 90° angle to the worktop, which is consistent with the methods used in our study. Administering the liquid slowly or to animals that were positioned horizontally resulted in relatively poor distribution of the ink. In our study, we also found that aerosolized delivery exhibited significantly lower mimic levels in the lung than liquid formulations, and this was observed consistently for both intratracheal and intranasal routes of administration. Taken together with the additional complexity and higher cost of implementation (i.e., cost of nebulizer, and potentially a ventilator to improve delivery), we would not recommend aerosolized mimic delivery as a first option. The primary technical limitation associated with the aerosolized delivery in our study, is the relative ease with which aerosolized mimic molecules are dispersed and lost to the environment, which might explain the reduced lung mimic levels compared to liquid formulations. In the case of intranasal delivery, which in our study was conducted by exposing rats within an enclosed chamber, much of the aerosol might be deposited on the skin and chamber walls, or along the nasal passage and oropharyngeal cavity and subsequently swallowed. Similarly, with intratracheal delivery (without ventilator assistance) we speculate that much of the mimic aerosol was lost due to backflow under the high momentum of the compressed gas source (despite reducing the gas flow rate to the lowest available setting). The use of a ventilator allowed for better control over the flow rate of the aerosolized mimic and improved lung levels compared to non-ventilated rats; nevertheless, aerosolized mimic would still be lost during each expiration cycle. We speculate that these limitations could potentially be overcome using a MicroSprayer (Penn-Century Inc.) device that was designed to facilitate aerosol delivery in a low-momentum air-free and highly concentrated format. This method has previously been used for miRNA mimic delivery in a rat model of pulmonary hypertension. However, this device is no longer commercially available. Of note, despite the limitations of non-ventilator-assisted intratracheal aerosolization (IT-A) identified herein, previous studies have shown that this method can deliver miRNA mimics or anti-mirs in rat models of pulmonary hypertension and induce significant biologic changes in these models. It is unclear whether the biologic efficacy associated with this method is miRNA-specific, or whether subtle differences in methodology provided higher than expected lung uptake. Variability in mimic uptake in the lungs between biological replicates is another important metric that was assessed, since this might translate into variability in downstream biologic effects. Although we are cautious not to over-interpret the results of experiments with small sample sizes, it is worth noting there were marked differences in the level of variability in lung mimic levels observed after delivery by IN-L and IV, versus the other methods. IN-L showed the highest coefficient of variation in pulmonary mimic levels, which we speculate may be due to the potential for rats to ingest some mimic during delivery. In contrast, IV delivery showed the lowest coefficient of variation in lung mimic levels, which seems consistent with the expected benefit of delivering the mimic directly into circulation (via jugular vein) since the lung is the most vascular organ in the body. Although IV delivery showed ~100-fold lower mimic levels in the lung compared to IT-L at 2 h post delivery, there was only a ~10-fold difference between the methods after 24 h, suggesting that mimics delivered by IV may experience a slower rate of clearance. Since the non-mammalian miRNA, cel-miR-39, could potentially be subject to different clearance and/or uptake mechanisms than mammalian miRNAs, we further investigated the general utility of IT-L delivery using a mimic of the endogenous mammalian miRNA rno-miR-124. 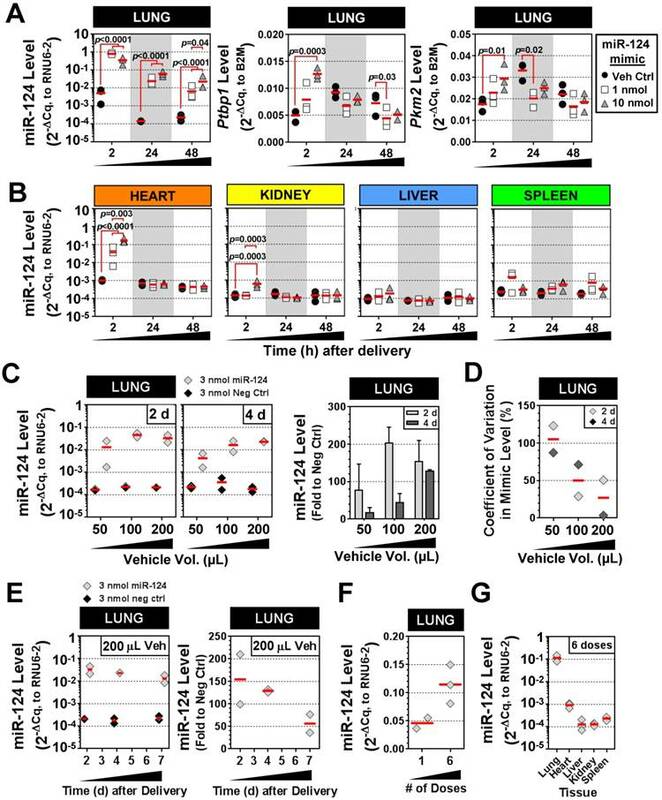 We confirmed that IT-L delivery of 1 nmol mimic could significantly elevate miR-124 levels in a lung-specific manner over basal levels, and induce changes in known messenger RNA targets of miR-124. The relative proportion of mimic to liposome molecules (within the delivery vehicle) was also shown to be an important consideration, as made evident when the quantity of mimic was increased by 10-fold (i.e., from 1 nmol to 10 nmol, in a fixed volume of invivofectamine vehicle), but only provided a ~2- to 3-fold increase in lung mimic levels. We subsequently showed that higher levels of invivofectamine achieved through an increase in the total vehicle volume could improve lung mimic levels, and potentially reduce the variability in mimic levels between biological replicates. It is also noteworthy that the delivery of various quantities of mimic and invivofectamine by IT-L administration was associated with only a modest and sporadic induction in IL-6, TNFα or MCP-1 expression within the lungs, suggesting a minimal inflammatory effect. For application in some diseases such as pulmonary hypertension, the ability to target pulmonary endothelial cells, which are known to contribute critically to underlying mechanisms of disease activity, is another important consideration. One limitation of this study is that localization of the mimic to specific cell types was not directly assessed, as this would have been time and cost prohibitive to conduct in any comprehensive format. Nevertheless, it is clear that miRNA mimics delivered by IT-L can pass innate barriers within the lung (e.g., mucous layer, surfactant, epithelial cells etc.) and reach the systemic circulation (as evidenced by elevated levels directly in the plasma and in all peripheral tissues that were examined), and therefore have access to the endothelium. Another limitation is that the pulmonary uptake of miR-124 mimic was not assessed systematically using all 8 delivery methods. However, we anticipate that the results of the cel-miR-39 delivery experiments should be generalizable to rno-miR-124 and other mimics of mammalian miRNAs, which share common physicochemical properties. Another potential limitation of this study is that the effects of different transfection reagents/vehicles were not investigated. We used the cationic liposome-based reagent, invivofectamine (ThermoFisher), because it has been specially formulated to minimize in vivo toxicity, and related carriers (i.e. lipofectamine, ThermoFisher) have been used commonly in the literature. Nevertheless, it may be worthwhile to explore other types of transfection reagents that have been reported to exhibit lung-selective gene transfer properties, such as cationic polyethylenimine  and some neutral lipid emulsions . Our demonstration that intratracheal administration of a liquid formulation of miRNA mimic provided the highest lung-specific delivery is an important finding given that other common methods were found to be orders of magnitude less effective. This result suggests that the choice of delivery method may have a substantial impact on the modulation of downstream molecular targets, and ultimately, on therapeutic outcomes. Optimized delivery also offers other pragmatic benefits, such as the potential to reduce the quantity of mimic employed. This would reduce costs and help to minimize the possibility of off-target effects and/or toxicity. Of note, in our study we observed no evidence of a significant and/or sustained inflammatory response to either the liposome vehicle or miRNA mimic. In addition, because we evaluated 8 different delivery methods, and quantified mimic levels in 6 different tissues (including plasma), we anticipate that our results could provide valuable insight to help guide in vivo miRNA mimic studies across a broad spectrum of both pulmonary and non-pulmonary diseases. Furthermore, though our experiments were conducted exclusively in rats with miRNA mimics, we speculate that the relative effectiveness of delivery strategies should also be generalizable to applications involving mice and miRNA inhibitors or other molecular agents with similar physicochemical properties. PBS: phosphate buffered saline; IT-L: intratracheal-liquid; IT-A: intratracheal aerosolization; IT-AV: intratracheal aerosolization with ventilator assistance; IN-L: intranasal liquid; IN-A: intranasal aerosolization; IV: intravenous; IP: intraperitoneal; SC: subcutaneous; RT-qPCR: reverse transcription-quantitative polymerase chain reaction; miRNA: microRNA; IL-6: interleukin 6; TNFα: tumour necrosis factor alpha; MCP-1: monocyte chemoattractant protein 1; Ptbp1: polypyrimidine tract-binding protein 1; Pkm2: pyruvate kinase, muscle; SuHx: sugen plus chronic hypoxia; MCT: monocrotaline; PH: pulmonary hypertension; LPS: lipopolysaccharide. This work was supported by the Canadian Institutes of Health Research (FDN-143291 to DJS), and the Entelligence Young Investigator's grant from Actelion Pharmaceuticals US, Inc. (KS). The authors thank Dr. Yupu Deng, Katelynn Rowe and Anli Yang for technical assistance. Conception and design, KS, MT, DJS; Data Acquisition, KS, MT; Analysis and Interpretation, KS, MT, DJS; Manuscript Preparation, KS, MT, DJS.